Why do I feel happy when I check the weather forecast and realize that it’s going to be sunny with no rain? Well it’s not because I’m worried about storms, flooding or tornadoes. I don’t mean to diminish Mother Nature’s awesome power, but I look at these natural events as part of the Earth’s hydrologic system. I actually see beauty and wonderment in natural weather cycles. Unfortunately, I still get a little disappointed because I can’t ride my bike. When I say bike, I’m referring to my 2012 Triumph Speed Triple. The brand and type of motorcycle is really irrelevant. All bikers know that we are a special club-the one percenters. We recognize each other on the streets and highways with a nod of the head, two fingers down to the left or a small wave. I wave to Harleys, Hondas, Yamahas, Ducatis, and Beamers. Almost everyone I wave to reciprocates with the special nod or motorcycle wave. Meanwhile, cars and trucks speed by lost in thought or lost in conversation on their cell phones. I’m not immune to getting in my car, turning on NPR and switching my brain to automatic mode. You know, it’s a subconscious thought pattern based upon days, weeks, even years of doing the same thing over and over and over again. It’s habit. It’s what takes you the same direction to the store, to work or home. It’s what makes you park in the same spot, sit in the same chair and mindlessly go about your life’s activities. This blog is about breaking away from mindlessness or habit. It’s about understanding who you are, where you’re going, and what you’re doing right now. Mindfulness is what is missing in today’s fast pace electronic world. Mindfulness is about enjoying the simple things. It’s about recognizing the bee hovering over me while I type this. It’s about smiling at Teddy, the neighbor’s kid. It’s about preparing my homemade salsa then taking that first mindful bite with blue chip in hand. It’s about slipping on my helmet, zipping up my jacket, gently inserting a key and listening for the rev of the engine and understanding the power and freedom beneath me. 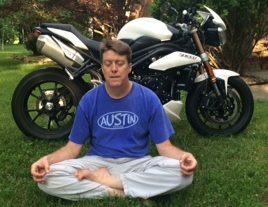 Motorcycle mindfulness seems like a strange juxtaposition for anyone who finds motorcycles meaningless or dangerous. However, motorcycles are a perfect medium to experience mindfulness. So put on your metaphorical helmet; zip up your jacket; turn the key to your mind wide open; click your left and right brain into first gear; and twist the throttle of your imagination. There’s no telling where this ride will take you. This entry was posted in Uncategorized on May 28, 2016 by mwgeoguy. It’s so true! You have to pay attention and be in the moment and that’s what makes it so mindful. It’s great to hear from a like-minded enthusiast. I love the picture on your blog. Maybe we’re what you could call ‘Likemindfulness’!